"I had these at a graduation party and they were wonderful. I was shocked when they told me the ingredients. I've made them ever since and they always go like hot cakes! 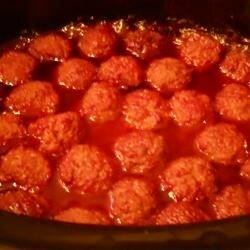 Either hand roll meatballs using your favorite meatball recipe or purchase frozen prepared meatballs. If you use frozen, allow for more simmering time." See how to make amazing meatballs in the slow cooker. I make this but use Chili sauce and grape jelly. Good stuff! Can't beat it for a gathering, make a crock pot full of them! used blackberry jam, chunky hot salsa, teryaki sauce, green onions...awesome!